Where is Murgon & the Bjelke-Petersen Dam? Murgon is located on the Bunya Highway approximately 245 kilometres north-west of Brisbane. The Bjelke-Petersen Dam and the Yallakool Tourist Park on the dam's foreshores are located 12km from the centre of Murgon's CBD. 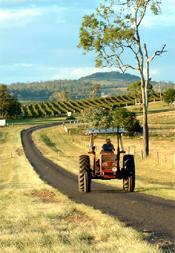 Key centres of the South Burnett wine trail (such as Redgate and Moffatdale) are located 15km to 20km from the CBD. How big is Murgon & the Bjelke-Petersen Dam? Murgon is a mid-sized town and has a permanent population of around 2600 residents. A further 1900 residents are spread through the Shire. Murgon is also the most ethnically diverse town in the South Burnett (the aboriginal community of Cherbourg is located less than 6km away). The Bjelke-Petersen Dam and Lake Barambah have no resident population. But the Yallakool Tourist Park has permanent on-site managers and the Dam's population can swell to several thousand during holiday periods as campers and caravanners converge on the area. Murgon is a very relaxed, friendly country town that has all the amenities of a much larger centre. It has its own hotels, motel, caravan park, restaurants and cafes as well as a golf club, bowling club and RSL (the later completely refurbished in late 2001 at a cost of $2.2 million). It also has a supermarket and convenience stores, many retail and craft outlets, a 24-hour petrol station and many garages, a heated swimming pool and The Pulse, a very large conference, convention and sporting centre. Murgon's CBD - which has undergone extensive beautification in recent years - is also the location of the Murgon Visitor Information Centre (the Centre provides easy off-street parking and amenities for tourists). The nearby winery areas of Redgate and Moffatdale are home to a numerous commercial wineries and a number of modern B&Bs and farmstays. The area around Murgon is largely rolling grassland grazing country interspersed with small stands of eucalypt forests. The terrain is slightly hilly and this affords good views from nearby Jack Smith Environmental Park and Boat Mountain Conservation Park, both a short drive from the town centre. Major annual events include the Queensland Dairy & Heritage Museum Australia Day celebrations (held each January); the Murgon Show (held in March each year), Vine Dining (held every August), the Bjelke-Petersen Dam Family Fishing Classic (held each October), the Murgon Rotary Music Muster and Murgon Art Show (also held each October) and the Christmas Carnival (each December). What is the Bjelke-Petersen Dam like? Lake Barambah is a 2150+ hectare inland lake created in the early 1980s when the Bjelke-Petersen Dam was built across Barkers Creek to supply water to the upper areas of the South Burnett. It offers world-class water-skiing, boating, fishing and water sports facilities and is one of the two great lakes of the South Burnett (the other is Lake Boondooma, west of Proston). The Bjelke-Petersen Dam and Lake Barambah were originally controlled by SunWater but management rights for the for the Dam's camping and recreational facilities were transferred to Murgon Shire Council in the 1990s. Control then passed to the South Burnett Regional Council in 2008 following the Council mergers that happened at that time. 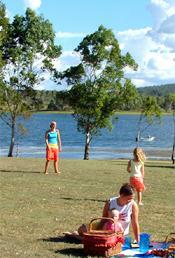 The South Burnett Regional Council now operates the modern Yallakool Tourist Park on the foreshores of the lake. This multi-million development offers inexpensive, high quality caravan, camping and cabin accommodation on the Lake's foreshores along with tennis courts, a children's playground, inground swimming pool, amenities blocks, a central kiosk, extensive landscaped picnic and BBQ areas and two boat ramps. Yallakool has also become a very popular destination for inland waterway enthusiasts and several major annual sporting and community events are staged there each year. Murgon Shire was first settled by Europeans in 1843 when pastoralists Ferriter and Uhr took up land in an area that became known as Barambah Station ("Barambah" is an aboriginal word meaning "a place where water ripples" while "Murgon" derived its name from a lily pond on Barambah Station). At that time there were only two other stations in the region: Taromeo Station near present-day Blackbutt; and Henry Stuart Russell's selection at Burrandowan on the outskirts of present-day Kingaroy Shire. A steadily growing regional population in the 1880s and 1890s led to the first house being built in Murgon in 1904 soon after the arrival of the railway, and the first town lots were sold soon afterwards in 1906. The town's industrial base began in 1913 when a butter factory was established in Murgon, and consolidated when the South Burnett Meat Works was built on the outskirts of the town in 1962. Today Murgon is a thriving centre of the South Burnett's cattle and pork industries; one of the twin hubs of the South Burnett wine industry (the other is at Kingaroy, 45km to the south) and a centre of the State's emerging olive-growing industry. Murgon is also the principal service centre for the Bjelke-Petersen Dam and Lake Barambah, one of the South Burnett's two great lakes. Above: The Boat Mountain Environmental Park offers great views over the area. 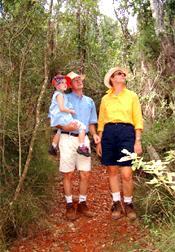 It also has family-oriented bush trails which provide a glimpse into the area's original ecology (photo courtesy of Clive Lowe).